The Sam Miranda Wines cellar door represents the first of a two-stage project. The brief was for a modern facility that improves the winery’s viability by creating a landmark destination for tourists and gourmands to the region’s growing viticultural industry. This facility was to be constructed away from the existing busy wine-making operations (production and grape-crushing plant). The project is sited to maximise its exposure from the passing traffic on the ‘Snow Road’ to Bright and cause minimal impact on the King River floodplain. The facility compliments the rural surroundings and vineyards and creates a place for the community to meet. Sited behind earth berms, the bold tower stands as an icon on the King River flood plain. 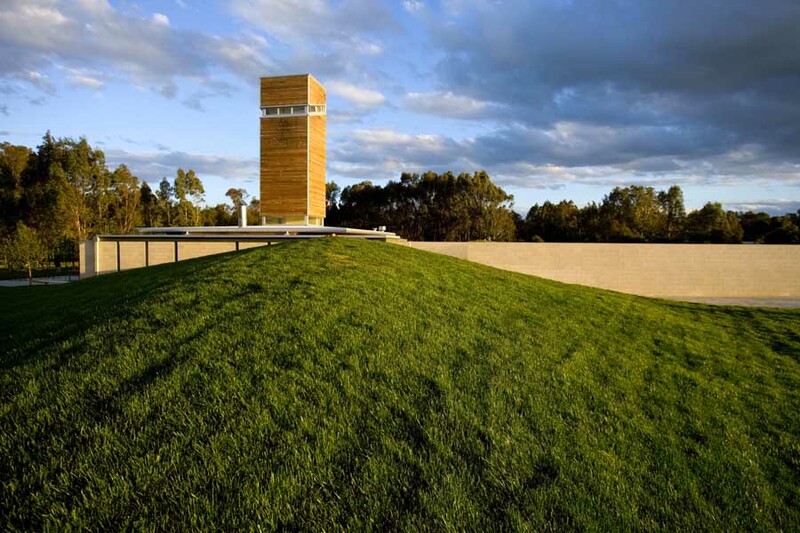 The tower provides light and ventilation into the ‘subterranean’ wine tasting area and invokes nostalgia of the old tobacco drying towers in the region. There will be three towers at the completion of the second stage. 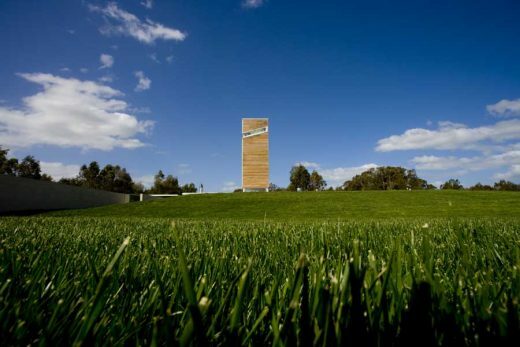 When considered as part of the total scheme, one is reminded of the tower forms of San Gimignano. This is “Kelly Country” and the ribbon window that wraps around three sides of the tower is reminiscent of Nolan’s abstracted Ned Kelly. From the open exposed landscape, the sequence of spaces culminates at the bar to taste the product. One approaches the bar to select from the extensive range of wines on display. Hold up your glass – you are invited to look up. Inside the sculptural space of the 14 metre high tower, a curved wall on one side helps to deflect light from the skylight roof down. In summer, the courtyard is a protected sunny space. The semi-enclosed external entry provides a protected outdoor area in winter. Forlico Builders input into ‘buildability’ in terms of cost, time, materials and trade sequencing helped drive the clarity in construction detailing. The budget of approximately $1 million relative to the 300m² building brief was challenging. The raw materiality of the building envelope such as face block, exposed concrete, plywood sheet and native timber weatherboards were used cost-effectively by working to the inherent modularity of each material. This rawness was juxtaposed to the refined finishes used for feature interiors of the bar and restrooms. The building’s primary spaces and its courtyard are orientated north. The main area opens on 2-sides. Operable windows high in the tower take advantage of the ‘Venturi effect’. 15,000L tanks supplies the facility. Wastewater is recycled in an underground concrete tank allowing anaerobic and aerobic bacteria to process the waste. The slabs and walls provide thermal mass. The ceiling and the lightweight walls have bulk insulation. Sam Miranda Wines has become a local landmark that provides a meeting place for locals and a pleasant stop-over for tourists. The cellar door’s success has allowed the viability of the project’s final stage, a café/restaurant.